The worksheets below will help students learn the differences between commonly confused words. Practice differentiating between lay and lie, fewer and less, loose and lose, saw and seen, as well as set and sit. Choose the correct word to complete each sentence. Write the word accept or except on each line. The words advice and advise may sound similar, but they have slightly different meanings. In this printable activity, students will practice using advice and advise correctly in a sentence. It's really tough to tell the difference between affect and effect! Help your students learn the difference with this printable activity. Students fill in the blanks with either "affect" or "effect." Students commonly confuse the words our and are. Practice differentiating between the two words with this fill-in-the-blanks worksheet. It's easy to mix up the words "bare" and "bear!" This worksheet gives students extra practice by instructing them to fill in the blank with the correct word, bare or bear. The words berth and birth may sound the same, but they have totally different meanings! Learn the difference and practice using these words in a sentence in this printable grammar exercise. An answer key is included. The words break and brake may sound similar, but their meanings are totally different! 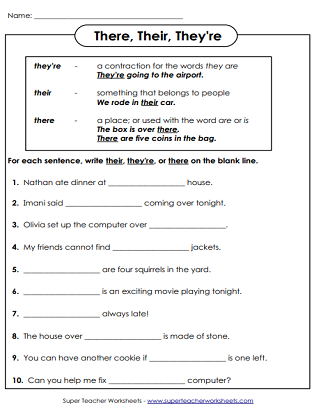 This worksheet will help students become comfortable using these similar-sounding words correctly in a sentence. Students can practice using capital and capitol in a sentence correctly by filling in the blanks in this printable grammar worksheet. Find out how to use cereal and serial correctly in a sentence! Practice filling in the sentences with the correct word choice. An answer key is included. The words compliment and complement may sound similar but have very different meanings. Students will practice using these words in the right context as they choose which word goes in each sentence. An answer key is included with this activity. In this grammar exercise, students will choose when to use dual and when to use duel in a sentence. An answer key is included with this printable activity. Wow! Farther and further can be really easy words to get confused! Learn the subtle difference between the two and then practice using them correctly in a sentence! Choose the correct adjective to complete each sentence. Choose between the words fewer and less. Do your students know the difference between foreword and forward? In this printable activity, they will choose when to use each word in a sentence. An answer key is included. Use the verbs lay and lie to complete these sentences. There is a loose screw on my toy. How could you lose your stuffed animal again? Practice sentences with loose and lose. I think I've lost my cell phone again. I am very sorry for your loss. 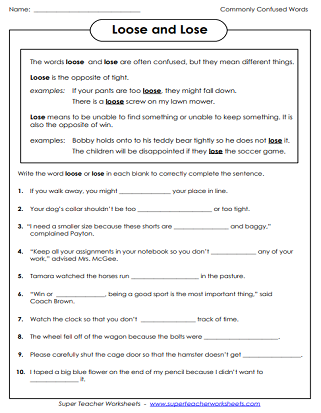 In this activity, students pick the best word (loss or lost) to complete each sentence. Learn when to use an apostrophe in the word its. The receiver caught the pass. The quarterback passed the fottball. We have been learning about the past in social studies. Choose between pass, passed, and past. In this activity, students learn the difference between the words, pedal and peddle. They must choose which word to use in each sentence. An answer key is included. The words pole and poll may sound the exact same, but they have very different meanings! 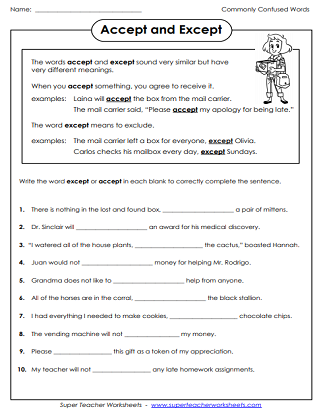 After your students learn the difference in the first part of this printable worksheet, they will practice using the words in the correct context in ten sentences. This pair of words is very easy to confuse! Principal and principle sound exactly the same, but they have quite different meanings. Your students can practice using them correctly in a sentence in this printable grammar activity. Have you seen the new movie? I saw it yesterday. For each sentence, write the word saw or seen on the blank line. Site and sight have completely different meanings, so make sure you can use them correctly! This activity gives students the chance to fill in the blank with the correct word, site or sight. Wow! These two similar-sounding words are very easy to mix up! Learn the difference and practice using "stationary" and "stationery" in a sentence with this handy worksheet. Lots of people get the words "than" and "then" confused! You can learn the difference and practice using these words correctly in a sentence with this handy worksheet. The words "thorough" and "through" are spelled almost the same, but be careful! They have different meanings! In this printable grammar worksheet, students will have the opportunity to practice using these words in a sentence. Students will decide when to use "through" or "threw" in a sentence in this printable grammar activity. It's easy to get the words "whose" and "who's" mixed up! This worksheet gives students the opportunity to practice using these two words correctly in a sentence! Choose there, they're, or their to best complete the sentences. Select the correct word to best complete each statement. Choose from the homophones to, too, and two. Use the words your and you're on the blank lines to complete the sentences. This page has several worksheets for teaching students about homophones. This is a complete third grade spelling unit with commonly confused words. Includes a word list, worksheets, a word wheel, flashcards, and assessment printables.